In a four-hour tour of Las Vegas, the president also meets with first responders from Sunday night's massacre. 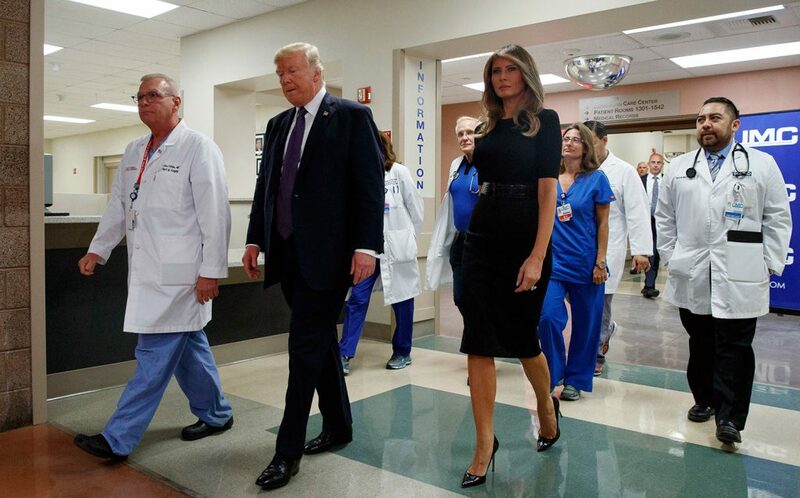 LAS VEGAS — Solemn in the face of tragedy, President Trump visited hospital bedsides and a vital police base in stricken Las Vegas on Wednesday, offering prayers and condolences to the victims of Sunday night’s shooting massacre, along with the nation’s thanks to first responders and doctors who rushed to save lives. “America is truly a nation in mourning,” the president declared, days after a gunman on the 32nd floor of a hotel and casino opened fire on the crowd at an outdoor country music festival below. The rampage killed at least 58 people and injured more than 500, many from gunfire, others from chaotic efforts to escape. His solemn words in Las Vegas offered a sharp contrast to his trip a day earlier to hurricane-ravaged Puerto Rico, where he spoke of the “expensive” recovery effort on the island and highlighted the relatively low death toll there compared with “a real catastrophe like Katrina” in 2005. “The example of those whose final act was to sacrifice themselves for those they love should inspire all of us to show more love every day for the people who grace our lives,” Trump said. Trump said after the visit that he’d met “some of the most amazing people” and invited them to visit the White House if they’re ever in Washington. Generous with superlatives, Trump also commended the doctors for doing an “indescribable” job. Trump then headed to the Las Vegas Metropolitan Police headquarters, where he met with officers, dispatchers and others who’d responded to the shooting Sunday night. Republicans who control Congress have made clear they have no intention of taking up stricter gun control measures in the shooting’s aftermath. However, senior GOP lawmakers said late Wednesday they could consider legislation banning “bump stocks” like the shooter in Las Vegas apparently used to effectively convert semi-automatic rifles into fully automated weapons.